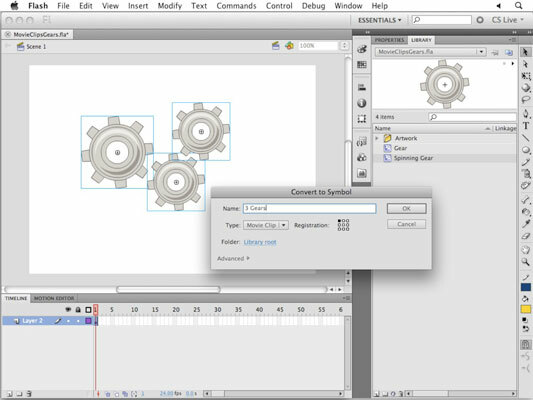 To create a new Adobe Flash Creative Suite 5 animation from several smaller ones, you can create a new movie clip from other movie clip instances on the Flash CS5 stage. This technique allows you to group several movie clips and drag them as one instance to the stage. Unlike with a group, you gain all the advantages of working with symbols, including the ability to duplicate, maintain, and tween the combined movie clips as one unit. The practice of including one movie clip inside another is sometimes referred to as nesting. Although movie clips can include other movie clips, graphic symbols, and buttons, graphic symbols shouldn’t include movie clip instances. Movie clips should always be included in other movie clips so that their animation plays back properly. Select two or more movie clip instances on the stage. These can be instances of different movie clip symbols in your library or of the same symbol. Enter a name for your new symbol in the Name text box, choose the movie clip from the Type drop-down list, and set the registration point by clicking a point on the grid shown to the right. Click OK to create the new symbol. The registration point sets the location from which a symbol’s position is determined on the stage. This point can be any of the four corners or four sides or the center of the symbol. The symbol instances appear on the stage as a single movie clip, and a new movie clip appears in your library. You can now drag and drop several instances of the new movie clip to the stage. Experiment by adding a few instances to the stage and applying different transformations or color effects to each one. Preview your movie by choosing Control→Test Movie. You see that the movie clips now are treated as one item, but still animate and behave as they did when they were separate instances on the stage. When you nest movie clips, you create dependencies between those symbols in your library. Movie clips that include other movie clip symbols do so by reference; the included movie clip symbols aren’t duplicated but are connected to the movie clip that includes them. Movie clips become dependent on any other symbols they’re created from. The smaller symbols remain in the library and are referenced by the movie clip that includes them, which means that you can’t remove included movie clips without destroying the symbols that they’re part of. For this reason, be sure not to trash any symbols in your Library panel until you’re sure that they’re not being used in your movie or by another movie clip symbol.